Got the RHA trueconnect at 254.90. With price match from stereo. Any suggestions for where to get this product shipped to sg? Hey any one use or come across Sudio telvo? Seems not too bad coz it has 7 hrs batt and case can charge another 4 cycle.. But dont know to sound quality though..
any good earphones that blocks out noise and announcement from mrt? what if they announce to ask you evacuate from train due to emergency? Any reviews on the x mini liberty xoundpods? Last edited by boiboi123; 26-02-2019 at 09:27 AM..
Bro, can you advise what is the price from qoo10? 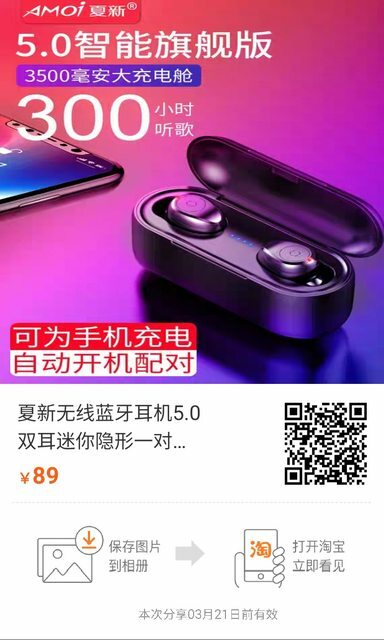 I can only see $269.90 from Connect IT from qoo10. And stereo is still selling for $273.60. My b&o E8 recently gets 'disconnected' suddenly sometimes. Bluetooth settings shows its still connected, and I can tap to play/pause. But the headphones connected logo on the status bar not there. Off on Bluetooth fixes it though..
Any review on the new jaybird run xt? Just got the Amoi F9 5.0, this version is supposedly the updated version with bt5.0. decided to buy and try since I'm in China for two weeks. Sounds wise is average, but must say it's better than expected. Bass is a little muddy, mids are surprisingly good, treble is ok as well. Disconnected 3 times (right bud) while typing this post. Winter now, jacket lots of static so I'll attribute it to this first. Charging case is pretty small, one third the size of my palm. Case can charge your phone as well (holds 3500mah). Overall is an excellent buy. Value ratio to me is through the roof, considering it cost me only RMB 89 (about SGD $18), free shipping since it was shipped to my place in China. Now back in SG listen to some songs, I'm liking this pair more now. Listening to Cheerleader, bass is tight enough, not as good as triplefis but obviously for the money you shouldn't expect it to be. In All falls down, when bass gets heavy that's where it becomes a little loose and muddy. But really just a little. Mids are great as per first impressions, trebles can become a little bright. Nothing eq can't correct. Finally got the right bud to fit my ear properly too, so yeah, money well spent lol. Got akg headphones in office and triplefis for better sound, this one for commuting. Not an audiophile, but I can discern quality a bit, and my choice eq is V shaped. Last edited by thumbtacked; 27-02-2019 at 11:12 PM..
Shop price is 273. Qoo10 shop discount gave 10% discount. If got cart coupon, it's additional discount. I think is a Bluetooth glitch. Happens to my Soul Aura and Jabra 65t. There isn't any shop discount from Qoo10 Connect IT now but I managed to get a $15 off cart coupon. Will camp for the next 2 weeks to see if there is further discount. what does your parcel tracking system show?